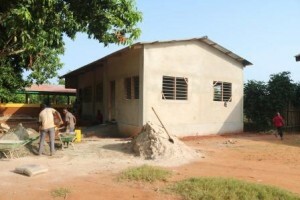 Home » Togo » Farm Update, New School Year, New Classroom and Office! Late September we were blessed to be able to have William Sawyer and Andre Houssney visit us. William Sawyer is from Eastern North Carolina. A friend of Sara’s family and the house Church that meets in their home is an active supporter of Togo Christian Mission. Andre Houssney is a friend we met through the Sawyers. Dovene was able to visit on Andre’s farm while we were in the US last fall as well, and it was very helpful in learning about many aspects of raising cattle and sustainable farming. During his trip here he and William spent a lot of time with us on the farm, strategizing and planning on how to best contain the water on the land so that we can benefit from it during the dry season, when it is scarce. William’s background in land development and Andre’s engineering background made for a great combo to work on this big project. Also during their time here Andre helped us start to implement rotational grazing on the farm. We currently have 4 cows on the farm that we are starting to work with. 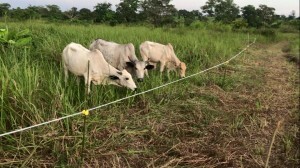 Andre trained Dovene and our farm staff in how to use our portable electric fencing to strategically graze them so that it can be to the best benefit of both them and the land. While working on the farm Andre was able to spend quite a bit of time with one of our newer local workers, Modibo. Modibo is a Fulani herdsman. This people group is largely unreached for the gospel as they typically live a migratory lifestyle with their cattle. Modibo was born into a Muslim family and was very devout follower. But after conversations throughout their time on the farm, Modibo decided to give his life to Christ. He spoke with his family before he made his decision and he was baptized right there on the farm. We also found out that he does have two sisters who are Christians, who have also been praying for his salvation. Praise God for how He works through all His people. Modibo recently went home for a short visit with his family and it went fairly well, and he even went to Church with his two sisters during his visit, which was encouraging to all three of them. 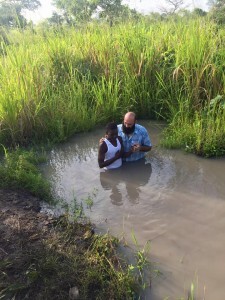 Please continue to pray for Modibo and his family as we feel that this is such an opening for the gospel for all of them. Pray that Modibo would stand firm in his faith and that we can help him grow as a brother in Christ. 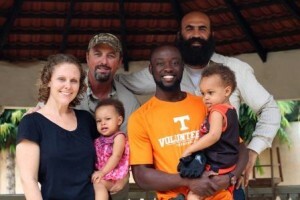 We were so thankful for William and Andre and all of their support and encouragement on this trip. They came and worked very hard and truly experienced the pioneer type work and obstacles we are working with here in Togo. May God richly bless them for all they do for the kingdom. We are also writing about a much needed financial issue. We know so many of you are giving so much and we praise God for providing through each of you and for the sacrifices you continue to make. But we are also coming up against something rather large that we are on our knees praying that God will help provide through His people yet again. We praise God for using people and Churches like to you change lives here in Togo. Only God can work to create partnerships like this for the gospel. Again though, we do ask for your help. We currently are in a big need for help with transportation. The roads here barely warrant to be called roads at times. Our vehicles are constantly in for repair as they wear out at an astonishing rate. 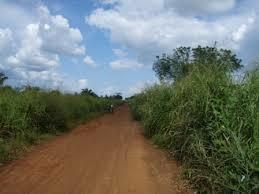 We work in villages that are considerable distance from our homes in order to reach others who are unreached. Dovene and I (Sara) recently sold the vehicle that we used as a family and for ministry as we could not afford the repairs on it any longer and we knew if we did not sell it at that point we would soon be facing yet another major financial repair. We are hoping and praying that others will join us to help add some funds to this amount in order to purchase a vehicle that is better able to handle the road conditions here. We are in need of $23,000 in order to purchase a vehicle that is sturdier and will last longer in these conditions. Even as I write this the truck we use for the farm barely made it back to the mechanic’s shop where we are trying to fix major issues related to a broken thermostat and diesel pump that has broken and the resulting damages to the engine. So we are out of transportation. But we are coming on our knees, praying that body of believers will rally behind us once more in our time of need. If you would graciously consider contributing towards this need donation information is available below as well. I know it may seem like a large amount, but if many hands work towards the goal I know we can reach it. May God bless you all abundantly for all you do in Christ’s name! We also have started a new school year the past two weeks. This year we expanded by another grade again to include 1st to 8th grade. We are very excited to see all the students returning. We have also been busy with a construction project in the past month. God has graciously worked to help us build a first grade classroom and office. This is the work of many helpers in the kingdom. We were blessed last fall by partial funding for the office portion of the building by some of our student sponsors who came together at Creekside Church of Midlothian, TX to contribute towards this. Now we are blessed to have an office and the first grade students now have their own classroom instead of having to set up and take down in the Church room each day. New school benches and school supplies were able to be purchased through some donations that have been taken from Christmas giving from our partners at Christ’s Church of Greenville each year. Sometimes it is truly amazing when you work though the finances how God plans things out and works through His people to provide at just the right time. We praise Him for this and give thanks for all you who helped contribute to make this school year possible. Here’s to another year of growing and discipling!